In temperate climates, influenza displays distinct seasonality: infections mainly occur from November through March in the northern hemisphere, and from May to September in the southern hemisphere. The results of experiments in guinea pigs have revealed that aerosol transmission of influenza virus is most efficient in cold and dry conditions, and completely blocked at warm or humid conditions. Therefore it has been suggested that seasonality of influenza in temperate climates is regulated by temperature and humidity. In the tropics, influenza activity is more sporadic, occurring throughout the year or in temporally irregular outbreaks. One hypothesis to explain this pattern is that transmission in these areas occurs by contact, not by aerosol. To determine if influenza transmission by contact is influenced by humidity and temperature, infected and uninfected guinea pigs were housed in the same cage. The effect of environmental conditions of spread of virus to uninfected animals was then determined. The results show that temperature or relative humidity have little effect on the efficiency of transmission by contact. Based on the results obtained in guinea pigs, the authors suggest that transmission of influenza viruses in the tropics is mainly through direct or indirect contact. But it’s not clear that influenza occurs in all tropical countries in a sporadic, year-round pattern. 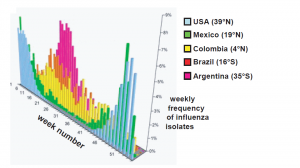 Effect measure has an excellent post on this topic called “Do the tropics have a flu season?” They point out that a two-year study in Nicaragua revealed that influenza shows a characteristic seasonality with a peak in the middle of the rainy season. The increased number of summer cases is a consequence of increased surveillance and testing of patients with influenza-like illness. The 2009 swine-origin H1N1 influenza virus has a unique ability to transmit by the aerosol route even in warm or humid conditions. The 2009 swine-origin H1N1 influenza virus can be transmitted by aerosol under hot and humid conditions because humans have little population immunity to the virus. The virus is being transmitted mainly by contact in the northern Hemisphere and with unusually high efficiency due to the low level of population immunity. The authors rule out explanation #1, mainly because seasonal H1N1 and H3N2 viruses which circulated in the winter of 2008-09 have not been detected frequently during the spring and summer of 2009. They believe that the remaining hypotheses are all possible, but prefer #4. I don’t know the basis for their preference, and they do not elaborate. Our understanding of influenza seasonality has markedly improved in recent years, but is still incomplete. Information obtained from viral infection of animals may provide clues, but will rarely answer all the questions about human infectious diseases. You should not find this conclusion surprising: how could infecting a few dozen guinea pigs in plastic cages model what occurs in billion of human beings spread across an ecologically diverse globe? it , by breathing or contact. Vitamin D deficiency? A hypothesis that may explain susceptibility better than the PLoS Pathogens article is Epidemic influenza and vitamin D. (Epidemiol Infect. 2006 Dec;134(6):1129-40. Cannell JJ, Vieth R, Umhau JC, Holick MF, Grant WB, Madronich S, Garland CF, Giovannucci E.) If as Lowen at al suggest cold dry conditions favour transmission, then it is pretty unexplicable how the exact opposite, the rainy season with its warm and moist wetaher would favour transmission/infection in the tropics. Vit D deficiency would at least be a more valid proposition in both cases. It seems to me that the rainy-season peak in Nicaragua could still be accounted for as a result of increased contact transmission (and not necessarily a virus with greater aerosol transmission in heat and humidity) because the rainy season itself might influence human-to-human contact frequencies by making it more likely for humans to be in close quarters, while they are sheltered from the rain. This same pattern may very well exist in temperate climates as well, with the cold weather season as the cause for an increase in human contact. Because cold weather also coincides with better conditions for aerosol transmission, it would be difficult to determine if this contact-transmission cycle exists in temperate climates. just ask the ILI-people how crowded they were, whether known contacts had ILI. I find it amazing that they can't figure it out despite so much research. Read the post at Effect Measure that's referenced in this piece.